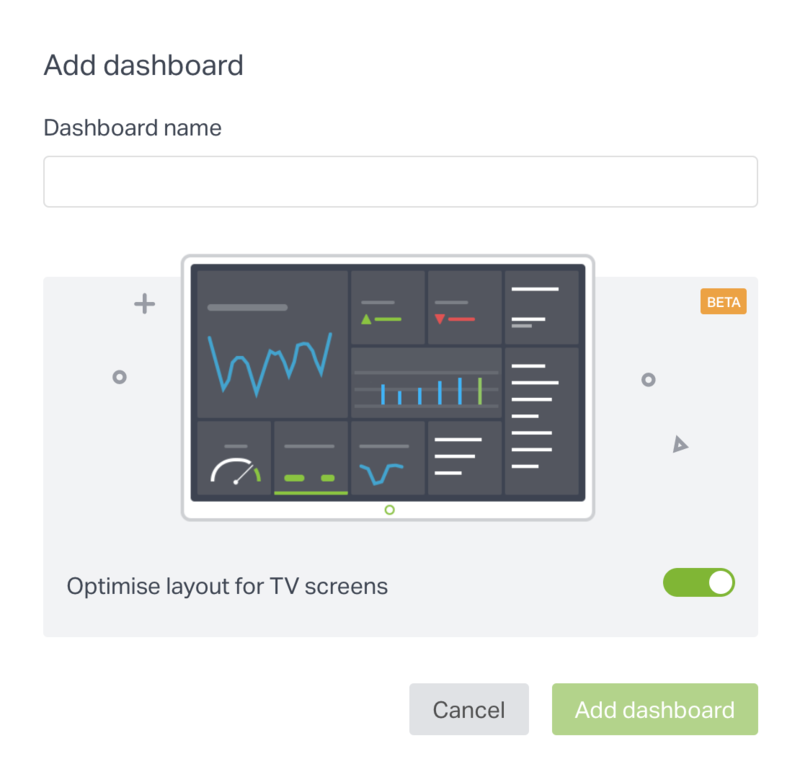 Geckoboard makes it easy for you to build a dashboard specifically for viewing from a distance on TV screens or monitors. You'll arrange your widgets on a fixed grid layout, ensuring accurate proportions for screen aspect ratios. To learn more about selecting the appropriate hardware and connecting your TV display with Geckoboard, read this guide. You cannot apply Custom CSS to style your dashboard using the fixed grid layout. If you use Custom CSS and want to build your dashboard so that it's optimized for TV, try our custom theme options. In the top left hand corner of your screen, click  Dashboards. At the bottom of the pop-up menu, click Add dashboard. Give your new dashboard a name and make sure Optimize layout for big screen is on . Your new dashboard will scale to fit your screen as you're building it, allowing you to see exactly how it's going to look on your TV. Your widgets will also snap to the grid, so you don't have to be precise about alignments. Vertical scroll is incompatible with landscape TV dashboards, which means that your widgets cannot be positioned off the fixed grid. This guarantees your dashboard to look great on any standard TV screen used in landscape mode. It is not currently possible to create TV dashboards in portrait layout. All widgets in the grid will display on your TV once you set the dashboard up using Send to TV. There are two types of grid layouts: Standard and Dense. Creates a 6w x 3h grid that is best for focusing on a few key metrics. creates a 8w x 4h grid that is convenient for displaying more data. Select the density of your dashboard grid. Widgets in the "off grid" area will remain hidden and won't display on Screens (or shared links). Use the "off canvas" area to try out new metrics and visualizations without inconveniencing anyone that’s looking at the screen. 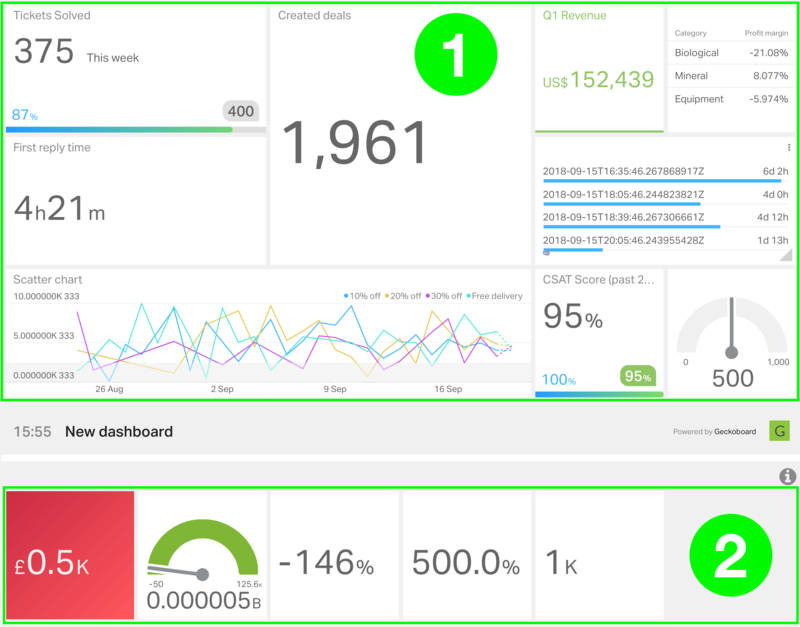 If you'd like to convert your existing column dashboard layout to one optimized for displaying on a TV, you can create a new fixed grid layout dashboard and make copies of the widgets from your existing dashboard. If you cannot fit all your existing dashboard widgets into the fixed grid layout, consider prioritizing them or creating a loop. 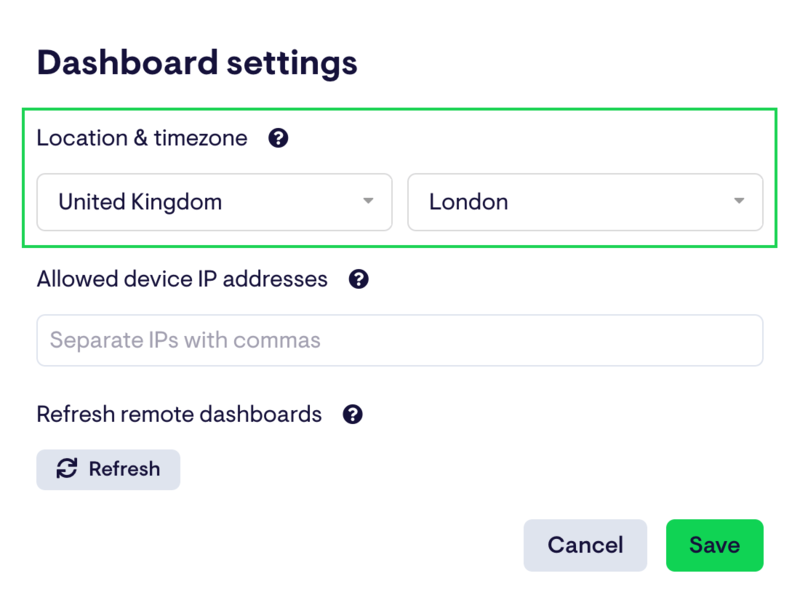 If adding a new dashboard will exceed your plan's allocation, drop us a line and we can add a temporary additional dashboard to your account in order to migrate your widgets. If you no longer need to display your dashboard solely on a TV, you can choose to convert it to a column dashboard layout. This will allow you to fit more widgets on your dashboard than the fixed grid allows. Select the dashboard you wish to convert. In the Dashboard settings modal, click the Convert to column dashboard layout link.